A review of Centre Health Insurance Company finds that a similar company, named Centre Insurance Company, with went out of business or was acquired by Zurich Financial Services sometime around 2005. Instead, this will be a review of Celtic Insurance Company, which provides health insurance coverage in the United States. Find the insurance coverage you’re looking for by entering your zip code in the box above. Then, shop the health insurance quotes from many different providers. Celtic Insurance Company is headquartered in Chicago, Illinois. The company strives to offer affordable healthcare coverage to individuals, families, and those that are self-employed. It currently offers policies in 33 states. Celtic Insurance Company was founded in 1978 as a holding company, with a company subsidiary operating in Chicago as a broker, insurance, and reinsurance company for group life and health products. In 1980, Celtic bought another insurance company, which gave it licensing to sell insurance in 49 states. Six year later, Celtic formed its Individual Health Division, which research, develops, and markets individual health insurance products. In 1999, its eBusiness department was created to broaden Celtic’s Internet presence. At the same time, the company developed online applications for customers and agents to both be able to purchase coverage online. Celtic also dropped the “Life” from its name and became just Celtic Insurance Company. In 2008, Centene Corporation acquired Celtic Group, Inc. Today, Celtic Insurance Company continues to be a successful specialty healthcare insurance provider. Celtic offers five different health insurance plans for individuals: Economical Basic Health Coverage; Comprehensive Health Plan; HSA Qualified Health Plans; Short Term Medical Insurance; and Affordable Student Health Insurance. All plans offer an initial 12-month guarantee. Features of each plan follow. Economical Basic Health Plan: A PPO with a choice of 70/30 coinsurance with $1,500, $3,500, $5,000, or $7,000 deductible, or 80/20 coinsurance with $1,500, $2,500, or $5000 deductible. The plans also offer two $30 co-pay office visits each year, with additional visits subject to deductibles and coinsurance fees. There is a prescription drug benefit, and policyholders can opt for the prescription drug option, which provides more prescription drug coverage. The Economical Basic Health Plan is for individuals ages 19 to 64 1/2 years, and their families. Comprehensive Health Plan: This plan offers three different options–Preferred Select PPO (Doctor and Hospital Network), Preferred “Any Doc” PPO (Hospital Network) and Preferred Managed Indemnity (No Network). Each of the three plans includes a choice of 80/20 coinsurance or 100% coverage after the annual plan deduction. The plans all include office visits, preventive care, labs and x-rays, prescription drug benefits, and emergency room and hospital coverage. However, the cost of these benefits will vary depending upon the plan you pick. 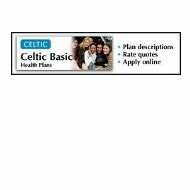 There is also a Healthy Lifestyle cash incentive offered by Celtic Insurance. HSA Qualified Health Plans: Choose from CelticSaver HSA PPO or Celtic Saver HSA Managed Indemnity. Both plans offer tax advantages. All fees at participating doctor’s offices, hospitals, and pharmacies are pre-negotiated. Short-Term Medical Insurance: Celtic offers a Gold and Silver plan for individuals and families from six months to 64 1/2 years of age. Policyholders choose their deductible amount, as well as the length of coverage, from one to six months. You can apply for up to three terms, for a total of 12 months of coverage. Affordable Student Health Insurance: Celtic PostGrad is insurance for students or individuals between graduation and their first job. Similar to Celtic’s short-term insurance, this plan offers coverage from one to six months, with a limit of three terms and twelve months of coverage. This plan is also available to foreigners living in the United States for two years or more, and in possession of a “Green Card.” The PostGrad plan does not cover preexisting conditions, or pregnancy. There are two ways to get online insurance quotes from Celtic Insurance Company. You can choose their online quote tool, where you need to choose from Individual & Family Health Insurance or Short-Term Health Insurance, and enter your zip code. Or, if you’re already working with an agent, you can enter that agent’s information into the search form and find out if they work with Celtic to get you the Celtic health insurance plan you’re looking at. Celtic Insurance Company has a comprehensive health insurance offering, but their products aren’t available in all states. If you still need to look at health insurance quotes, type your zip code in below and we’ll help you out with providers in your area.